Prague, the capital of the Czech Republic, is a tourists’ paradise offering all a tourist could hope for. From secret corners and romantic places overlooking the historically valuable city centre, which is protected by UNESCO, to opportunities of wild parties until early hours, Prague has it all. You can satisfy your curiosity in historical places, museums and galleries, every day you can choose from an array of music events, ranging from classical music to the latest pop music. Music clubs and theatres offering a repertoire open to all people without regard to their language differences are plentiful. Or if you prefer this could be replaced by a pleasant experience from, for example, a walk in one the most interesting European Zoos in Prague Troja. Try a ride on a Prague cruiser on the Vltava river or stretching your muscles on bicycle routes leading even through the historical centre. If you like sport, there are indoor swimming pools and hundreds of sports fields for myriads of sports from golf and tennis through to a bobsleigh run, skateboarding and in-line skating. The city, contrary to many places that are available to tourists only for the summer, does not stop living during the winter months. 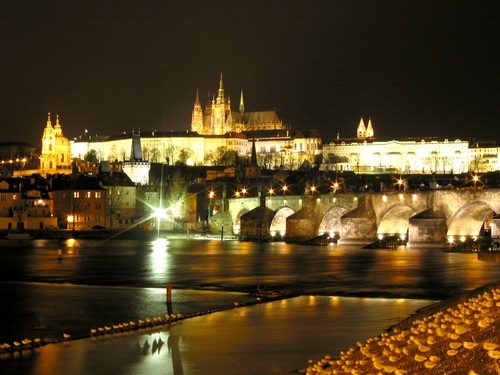 A New Year’s Eve spent in Prague may be an unforgettable experience. Nothing remains but to check it out.